If you hadn't noticed I have been on something of an update kick early in 2014. I didn't really have it in me to show what caused all of the debris in the original "Aftermath" from 1999. 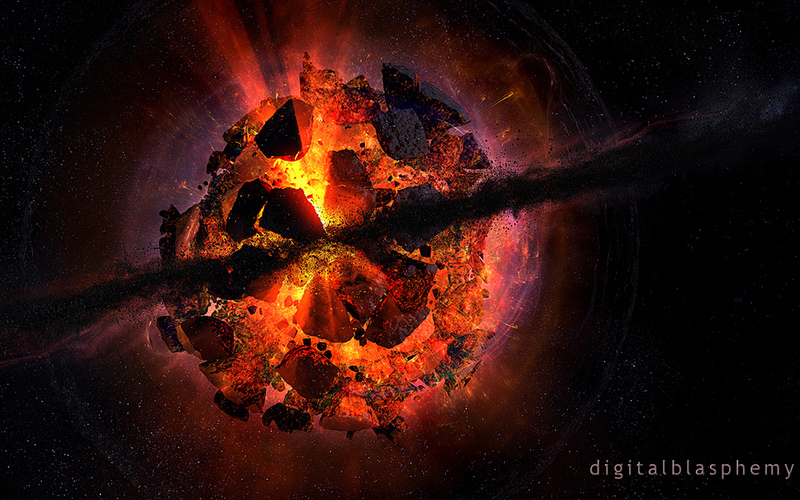 When I started playing around with Lightwave's Fracture tool I knew the moment had arrived to complete the scene. I've posted some "ind- devlopement" pics on my Instagram account if anyone is interested! This and the multi-screens look awesome. I cannot wait for the ground view of this one. Keep up the great work Ryan and may you have an awesome rest of the week. one of your best space themes. Much better! Looking forward to the multiscreens. "Kaboom just doesn't get it." Intense!! - You can almost feel the sheer force of the explosion as it races toward you at velocities unimagined, as well as the intense heat it generated. Nice job, Ryan. Sick! What a piece! I gave it a 9.5 simply because I'm leaving room for more 10s in the future. But... it has really had an impact on me. It's partly the fantastic image itself, and partly because I've just had my first ever (though I should know better at my age) experience of 'love at first sight,' followed quickly by my first ever experience of heart-break, and this image is an accurate representation of the whole thing. It's staying on my desk top for the forseeable future and gives me something to look at while crying into my gin and tonic. Thank you! I like this version much more than v.1; good work! I like the lighting here a lot. It really helps to convey the sheer power of the situation! I love it! And I am not sure where people were getting a star from. It's obviously a terrestrial planet exploding. Also, everyone putting a rating into their comments, please remember to actually vote on the picture in the drop-down above as well. I was only the 2nd vote, unless that is not reporting correctly. 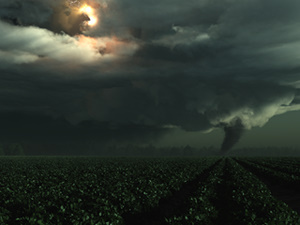 I've added an updated render of "Aftermath" to the gallery this morning. I've brightened things a bit, added some more fire and generally tried to make the scene look a bit less "flat". The asymmetry is still there, but not sure what I can do about it since the exploding object isn't very symmetrical. Amazing piece! As I said before about Asunder, the sense of movement in a space scene is a hard thing to convey, and it is done so here brilliantly. @Dr Chandra: Although a collapsing star may emit jets, that is something that happens after the supernova phase, when a gas is accreted by a neutron star or black hole, because of Sincrotron radiation. In a collapsing star (or any rotating gravitational system for that matter), interaction with a viscous medium and conservation of angular momentum concentrates material around the equator, which is what we see above. @Jenanne: Rarely explosions are that symmetric in space. You can see from supernova remnants (the crab nebula, for example) that the resulting gas cloud from the explosion is extremely irregular. In fact, a supernova explosion may shoot a star out of the Galaxy! A process that creates more nicely spherical structures is the pulse of red giants which spawns planetary nebulae, which is not an explosive (albeit beautiful) phenomenon. There are obvious inaccuracies here. 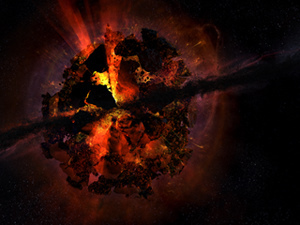 Typically as a star collapses, it spins up and forms jets of material that erupt from its poles. These jets then blast the star apart. Most explosions expels much or all of a star's material at a velocity of up to 30,000 km/s (10% of the speed of light), driving a unimaginable shock wave. Now depending on the radioactive nature of the core you will typically see some form of metal element such as titanium or iron but I digress. On the positive side...err...the colors are pretty. That was my poor impression of a stuffy "know it all". I gave it an "8". Cheers Ryan!! I would love to give this a 10, but I feel that the top of the explosion is too 'chunky' - and I think the reason it looks so, is that; it is so close to the front in relation to the original. Love the space scenes. This one will be especially interesting next time I'm letting my mind wander while it solves a problem. All the little stories about what is happening and why. Love it!!! The colors in this render are awesome. Thanks for such a great render. what are the green ray`s comming from the core ? And to be honest, it still seems a little flat, on the upper half the globe form is lost bij the big fragments. I love seeing how far you have come in 15 years. This is amazing. The only problem is it makes the original look somehow pale and paltry by comparison.